From cargo drones to flying taxis and supersonic passenger jets, the Farnborough Air Show had plenty of prototypes and promises for things to come. The Farnborough International Air Show, best known as the year’s biggest marketplace for passenger planes, also acts as a test bed for the aviation industry’s wilder imaginings. Boffins at U.K. engineering giant Rolls-Royce proudly displayed an array of miniature robots designed to speed up engine overhauls by removing the need for power plants to be detached from the aircraft during shop visits. 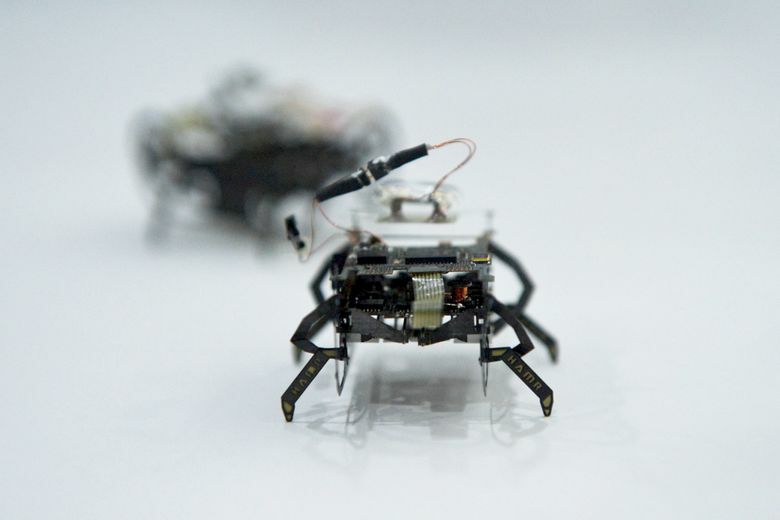 Cockroachlike “swarm” bots less than half an inch across will roam the turbine in gangs, beaming pictures back to inspection crews after being deposited by so-called “snake” hosts that work their way through the engine. If the bots don’t get you, the drones will. Farnborough is awash with unmanned aerial vehicles, or UAVs, ranging from delivery craft that guarantee to gently deposit a parcel by your door to the latest military types intent on blowing stuff up. The Black Swan from Bulgarian brothers Svilen and Konstantin Rangelov stands out for bringing a touch of eco-cool to the sector. Pitched as a sort of anti-Amazon drone better suited to emerging economies, the gasoline-powered model uses a gliderlike wing to carry 770-pound payloads for more than 1,500 miles and land on the short, unpaved runways common in Africa and other developing nations. The industry is forging ahead with plans for the pilotless plane. Experts will tell you it’s easier to fully automate an aircraft than a car (the chances of a collision while in motion are certainly smaller), but companies are hedging their bets and developing freight variants before trying to persuade passengers of that argument. Boeing indicated that unmanned cargo craft will be a priority for NeXt, a new organization formed to develop futuristic and disruptive products. On show at Farnborough was a rotorcraft model of the kind the company says could be buzzing over congested city streets within years — not decades. It was hard to find a major aerospace manufacturer that wasn’t touting a flying cab. Airbus and Boeing already have well-advanced plans but Rolls-Royce crashed the party with a plan to leverage vertical-thrust technology that dates back to the original Harrier jump-jet and the “flying bedstead” that wowed Farnborough crowds in 1950s. Luxury carmaker Aston Martin sought to get in on the act with a three-seat, hybrid-electric, vertical takeoff and landing aircraft that it hopes might appeal to the next generation of millionaire enthusiasts. Since the company’s autos aren’t actually capable of flight, Aston wisely said it will team up with Rolls (of jet-engine fame, not Aston’s carmaking rival) and experts from Britain’s Cranfield aeronautics university to get the project off the ground. The race is heating up between three companies seeking to channel the spirit of Concorde and reverse the untimely demise of supersonic passenger travel. Fault lines between them have become clear. Texas-based Aerion is pitching an eight-to-12-passenger model that’s essentially a faster (Mach 1.4) version of today’s business jets. Boom Technology of Denver is pushing a jetliner-sized, delta-winged 55-seater it says would reach Mach 2.2. Spike Aerospace of Boston is targeting a Mach 1.6 plane sized somewhere between the other two. Boom has signed up airline customers but delayed the flight of a prototype by a year at Farnborough, while Spike’s demonstrator model is subsonic. Aerion reckons it’s further down the line, having secured an engine partnership with General Electric and an accord that could see Lockheed Martin build its plane. 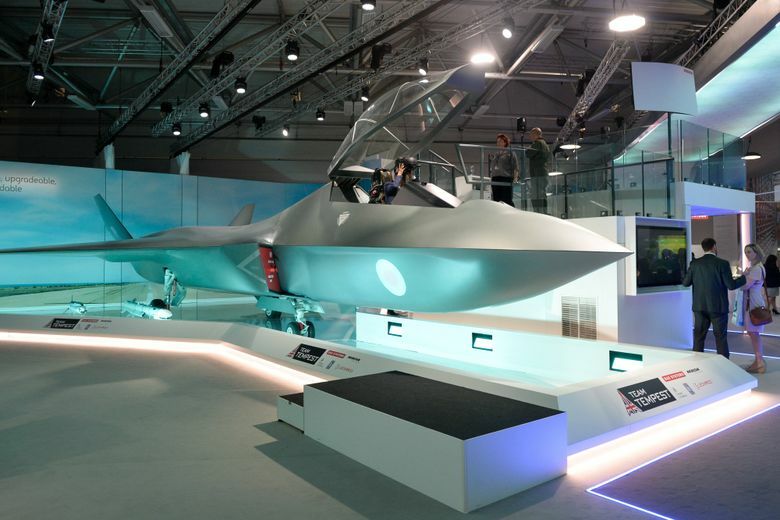 The show’s biggest splash came not in the commercial sector but the military one, with the U.K. unveiling the Tempest fighter mock-up developed by BAE Systems and partners. Britain hasn’t developed a combat jet without France or Germany since the 1960s and defense experts lined up to suggest the program will be merged with one underway across the English Channel once the Brexit dust has settled. But the plane certainly looked the part — a large, twin-engine design resembling Lockheed Martin’s F-22 — and the accompanying blurb suggested a production version would feature a virtual cockpit projected onto the pilot’s visor and futuristic-sounding laser-directed energy weapons. The jet could be manned or unmanned and would operate with a squadron of drone wingmen.